It’s the actual law that when you see a beautiful sunset in a videogame you have to stop dead in your tracks and take a screenshot. It’s a compulsion I’ve had since I saw my first really amazing one in Oblivion, the game that made me aware of the beauty and power of imaginary skies. And so here are some of my favourites, from Los Santos to the Northern Kingdoms, that I think are worth dragging your eyes away from the critical path to appreciate. Bungie is known for its dramatic skies, and while the Halo ring is perhaps its most iconic, it's the vivid, colourful worlds of Destiny 2 that I'm most fond of. They have a knack for scale, making these places feel massive, ancient, and mysterious, like this stunning view across Jupiter's moon, Io. Dark Souls' bleak, beautiful fantasy world is one of the most evocative around. There are a lot of striking skies to find across the trilogy, but it's the view above, seen when you enter Irithyll of the Boreal Valley, that has really stuck with me. It fills you with wonder, but also dread about what dangers lurk ahead. Palm trees silhouetted against a burning Los Santos sunset. Storm clouds rolling over the peak of Mt. Chiliad. Piercing blue skies hanging above the Grand Senora desert. The sky in GTA V is a dynamic, ever-changing thing that paints Rockstar's world with dense, evolving layers of atmosphere. The Long Dark's hand-drawn art style makes for some particularly striking skies, which look almost like expressionist paintings. The sunset above is a strong example of how beguiling this bleak, brutal world can be, lending the game an eerie, sombre atmosphere that suits its open-ended survival. The sunsets in The Witcher 3 are wonderfully exaggerated, filling the sky with fiery, crimson light. But when you travel to Toussaint, the setting for the brilliant Blood and Wine expansion, the mood changes and the heavens are filled with painterly clouds set against shades of turquoise and peach. Sometimes the sky on a planet in No Man's Sky is flat and lifeless. But then you find somewhere like the image above. It's the luck of the procedural draw. Its moons are particularly gorgeous, with the host planet looming silently on the horizon and giving you a dizzying sense of scale. The distinctive art direction of Firewatch, which makes exquisite use of silhouette and flat, bold colours, extends to its skies. The mood of the Shoshone is constantly changing, and the landscape stretching into the distance reminds you of just how isolated you are in this remote expanse. 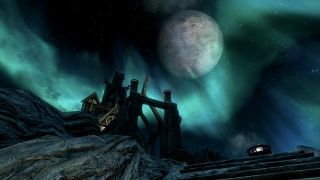 If you're lucky, night falling in Skyrim heralds the arrival of the northern lights. This natural light-show still impresses me, even after playing Skyrim for many hundreds of hours. Elsewhere, the way the sunset casts golden light over the crunchy snow is a subtler, but just as atmospheric, effect. There's something evocative about the wasteland in Mad Max, especially in the twilight hours when the sun begins to dip below the horizon and fills the sky with rich purples and pinks. When bandits aren't trying to harpoon you from their cars, this post-apocalypse can be a strangely beautiful place. The isolated Hebridean island where Dear Esther is set perfectly mirrors the downbeat, melancholy atmosphere of the story. The sun seems to be struggling through the clouds, trying and failing to shine through that thick canopy of gloom, which Scottish people will be all too familiar with. The newest entry on the list, Assassin's Creed Origins might be Ubisoft's best, and best-looking, open world. When you see the sun setting over the pyramids of Ancient Egypt, it's hard not to be awe-struck. And the dynamic clouds, which slowly drift and change shape, bring the sky to life. Okay, so space isn't the sky. But the striking celestial backdrops of EVE Online have always impressed me. The Icelandic MMO doesn't get enough credit for its atmosphere and world design, and there are some impressive sights, like the one above, to enjoy as you journey through New Eden. The desert wasteland in id Software's divisive post-apocalyptic shooter has some dramatic skies, with fat, looming clouds and ruined cityscapes. Even though it's a deceptively linear game, the scale of these detailed skyboxes makes it feel like a much bigger, broader world than it actually is. BioWare's grand space opera takes you to a variety of amazing alien worlds, and there's always a nice skybox to gawp slack-jawed at. Whether it's a remote alien world with a fiery blue sun or the immense arms of the Citadel stretching for miles, you're never short of incredible sci-fi scenery to look at.